President Erdoğan and French President Macron pose for photos at U.N. headquarters, Sept. 19, 2017. In his first visit abroad in 2018, President Recep Tayyip Erdoğan has put efforts to minimize Turkey's security vulnerability against external air threats at the center of his meeting with French President Emmanuel Macron at the Élysée Palace where the two leaders are expected to discuss the future of the joint Eurosam consortium, an inter-governmental project that will develop defense systems, including air and missile defense systems. The expected agreement will enhance and speed up Turkey's initiatives to develop its domestic air defense industry in the long run and will also ensure to meet its short-term needs in air defense capability, particularly in long-range air defense missiles, Turan Oğuz, a defense industry researcher said. On Nov. 8, Turkey signed the joint Eurosam consortium agreement with the Italian and French defense ministers in an inter-governmental agreement at NATO headquarters in Brussels. The project with Eurosam, the producer of surface-to-air missile platform/terrain (SAMP/T) and Aster 30 long-range surface-to-air missile (SAM) systems, will strengthen defense ties between the three countries in general and particularly in air and missile defense. "The meetings in France will discuss feasibility surveys and allocate the division of labor between the parties. It will set the agenda on how to go forward. The feasibility survey is expected to be completed in 24 months once signed, and then the next decisions will be made," the defense strategist Turan Oğuz said. Given the threats in its region hit by civil wars, particularly after the emergence of terrorist groups such as Daesh and the People's Protection Units (YPG) in 2011, NATO-member Turkey acquired U.S. Patriot defense systems to be deployed in the southeastern part of the country. Four Patriot batteries were deployed in Turkey in 2013, but they were removed in 2015, leaving the country vulnerable to threats. Previously, Ankara had also looked into a possible deal with China in 2015 for $3.4 billion to develop a long-range missile defense system, but it was canceled by Ankara, which had said then that the focus would be on developing domestic systems. On Dec. 29, Turkey finalized the S-400 missile defense systems deal with Russia, which includes the purchase of two S-400 surface-to-air missile systems and four batteries, costing Ankara $2.5 billion as part of the country's attempts to meet its defense needs. Oğuz said that while Ankara has purchased the S-400 air missile systems from Russia, their incompatibility with NATO systems would not allow their use to full capability, creating a need for a system that works with current NATO systems. "Turkey currently has been developing the Hisar-A low altitude air defense system and HİSAR-O medium-range air defense system by ASELSAN and Roketsan since 2007. The Hisar-A will be completed by 2020, and the medium-range defense system's prototype will be completed by 2021. Turkey's ASELSAN has also completed the development of KORKUT, a self-propelled air defense gun system for effective ground-based air defense against air threats. In addition, Turkey is also developing high-altitude and long-range missiles, which are expected to be ready in 10 years," Oğuz said, adding that the consortium with Eurosam will significantly contribute to Turkey's aim of developing an air defense umbrella against elements threatening its national security, which will also be compatible with NATO systems. Eurosam's SAMP/T Aster 30 long-range SAM systems are already in use in several NATO member countries. "Particularly with the Eurosam consortium, Turkey has tried to balance the criticism emerging from the deal with Russia. However, this is not the only reason of course," Murat Yeşiltaş, a security expert for the Foundation for Political, Economic and Social Research (SETA) told Daily Sabah, adding that the new deal with the Eurosam initiative and defense investment project will "ensure that Turkey has a say in strategic defense politics in Europe and the region." The SAMP/T Aster 30 system uses a network of sophisticated radars and sensors, including 3-D phased array radar, enabling it to be highly effective against all types of air threats. The system can intercept missiles with a 600-kilometer range and can operate in standalone mode or can be integrated in a coordinated network such as the NATO missiles defense system. 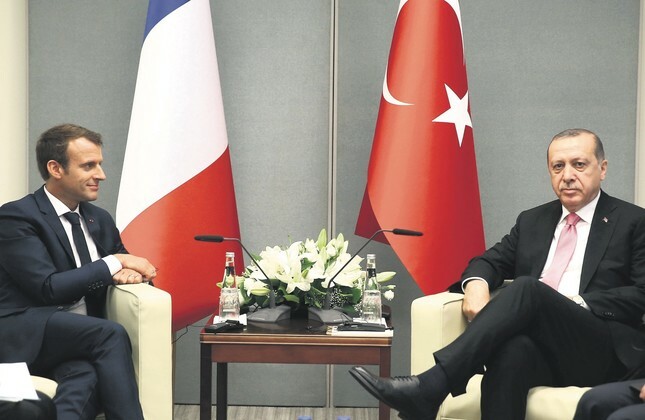 Erdoğan's meeting with Macron is expected to set the tone for Ankara's ties with the EU for the months ahead, following a year of strained ties. Recently, officials from both Turkey and EU member states have signaled an intention to start the New Year on a positive note, including Erdoğan who said it is Ankara's aim to minimize its enemies and increase its allies, stressing that Turkey has no problem with the EU member states. "France under Macron can be a key ally for Turkey in the post-Brexit EU and when relations with Germany under great strain due to political problems between the two countries since the July 15coup attempt," Erhan İçener, an academic from Istanbul Zaim University, said. Turkey has sought to join the EU for more than five decades, but despite several enlargement programs by the EU, Ankara has met resistance from EU institutions due to political reasons concerning Turkey's domestic dynamics. İçener said Macron could be a "new face and promoter of the ideals of European integration." "To fight against racism and Islamophobia in Europe, Turkey should gain allies like Macron against the likes of [Marine] Le Pen and [Geert] Wilders. This visit, I think, will also send a message to the EU and Turkish public that Erdoğan, despite his strong criticism, still cares about Turkey's relations with Europe." Ankara sees Berlin and Paris as the two significant players shaping EU politics. Strained relations with Germany due to disagreements with Berlin's counterterrorism policies, including those pertaining to the PKK and the Gülenist Terror Group (FETÖ), has made France a more influential party for Ankara in ties with EU member countries. "President Erdoğan conducting his first visit in 2018 to one of the founders of the EU, France, is important and meaningful. The EU should also understand the value of this," Turkish diplomat to the EU told Daily Sabah. Faruk Kaymakçı, ambassador and permanent delegate of Turkey to the EU in Brussels, said that France has had a positive stance on Turkey's relations with the EU historically, with the exception of the period under President Nicholas Sarkozy. "The president's visit to France and Foreign Minister Mevlüt Çavuşoğlu's expected visit to Germany present important opportunities to begin Turkish-EU relations with a healthy and longsighted note in 2018," he said. He added that Turkey and the EU "can increase cooperation in foreign policy, security, defense, energy, transportation, counterterrorism and migration management" and that Turkey is ready for further steps with regard to visa-free travel for Turkish citizens in the EU's Schengen zone. Turkey and the EU signed a refugee deal in March 2016 to discourage irregular migration across the Aegean Sea by taking stricter measures against human traffickers and improving the conditions of the nearly 3 million refugees in Turkey. The deal employs a one-for-one formula under which failed asylum seekers in Europe are returned to Turkey, while Syrian refugees are resettled in EU countries in a quota system. As another part of the deal, the EU said it would open two chapters out of 16 in Ankara's EU accession negotiations, provide funding for refugees and grant visa-free travel to Turkish citizens to the Schengen zone. One of the significant issues challenging Turkey's EU membership process that Ankara has cited has been that Turkey is a large Muslim country, making Turkey skeptics question whether there would be integration problems if accession were completed. Jana Jabbour, a research associate at Sciences Po Paris and a professor at Saint Joseph University in Beirut, said that the two parties are in need of each other as they have overlapping interests at economic, commercial and political levels. However, she said, "It is unlikely that this meeting will have a concrete impact on Turkey's EU process given that Europe is still reluctant to accept Turkey as a full member for reasons mainly related to identity. She added that Turkey, being located in the Middle East, would make the EU's border reach troubled areas in the region, such as war-torn Syria and unstable Iraq. Jabbour added that during Erdoğan and Macron's meeting, while Erdoğan will focus on improving ties with Brussels through Paris, Macron's priority would be to increase and stabilize counterterrorism cooperation with Turkey, as well as coloration on tackling the refugee crisis. Meanwhile, the European Commission's deputy chief spokeswoman yesterday said both Turkey and the EU are doing their parts in the refugee deal to curb irregular migration. "Turkey and the EU are doing what is required in the refugee deal. Our relations rely on close partnership. We want it to continue this way," she said in a daily news briefing. She said the commission valued its strategic partnership with Turkey on a wide range of issues from the refugee crisis to security.